One of my biggest frustrations on watching BBC TV’s ‘Question Time’ is that when UKIP representatives make incorrect statements about the EU, there’s usually nobody on the panel or in the audience to correct them. Take last Thursday’s broadcast of Question Time. Among those appearing on the panel was UKIP MEP, Patrick O’Flynn, who made a number of statements about the European Union that were wrong. As I discovered, shouting at the telly made not a blind bit of difference. He carried on regardless, without anyone in the studio able or willing to put him right. 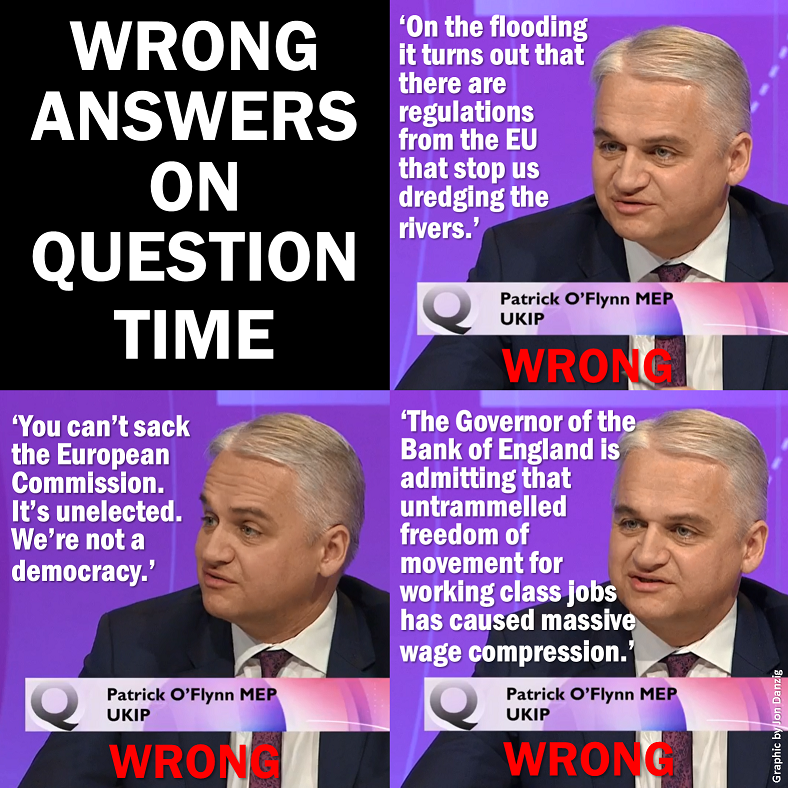 So instead, I’ll share with you here on my ‘EU ROPE’ blog three examples of Mr O’Flynn’s misleading statements on Question Time and explain how they were wrong. UKIP has been trying to blame the EU for Britain’s flood disaster. This is completely without foundation. The anti-EU party, along with some of the media, have claimed that the EU Water Framework Directive ‘bans dredging’. But that’s not true; the directive doesn’t ban dredging. Whether or not to dredge is a decision of each member state, not the EU, and based on the local situation. The UK Environment Agency recently announced that it had spent £21m on dredging in the past two years, so clearly, dredging hasn’t been banned at all. It’s also been claimed that the EU directive prevents dredged sediment being spread elsewhere. Again, this isn’t correct, unless the sediment contains toxic substances, in which case dredging could poison land and rivers endangering the health of humans and wildlife. Experts have commented that dredging can sometimes be an effective measure against flooding, but sometimes it can make matters worse. It’s up to our UK government agencies to decide whether to dredge, and not the EU. Furthermore, the EU has emergency funding of about £125 million to help Britain’s flooded areas. So far, the British government has turned down this fund, with the Prime Minister, David Cameron, claiming that Britain can afford to deal with the flooding from ‘our own resources’. 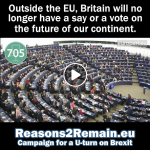 The laws and regulations of the European Union are debated and democratically agreed (or rejected) by the elected Members of the European Parliament (MEPs), in collaboration with the European Commission. We elect MEPs to represent Britain in the European Parliament; it’s nonsense to claim this is not democratic. The European Commission comprises 28 Commissioners, one from each EU member state, appointed every five years. The President of the Commission is decided by a majority vote of the democratically elected heads of each EU member state, which of course includes the UK. However, the choice of Commission President has to be agreed by a vote of the European Parliament, which can reject the candidate for President. Once Parliament has democratically approved the appointment of the EU Commission President, the President-elect selects the 27 other EU Commissioners, on the basis of suggestions made by each EU member state, including of course the UK. However, EU Parliamentary committees assess the suitability of each proposed Commissioner. Then, the Commission as a whole requires the democratic consent of the European Parliament, to whom the Commission is ultimately responsible. In fact, the European Parliament has the democratic power to sack the entire Commission of the European Union at any time during its 5-year tenure. 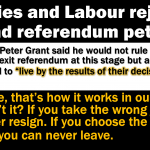 This is the same as national governments that can be booted out of office by national Parliaments if they lose a vote of confidence. The European Parliament is one of the world’s largest democratic assemblies, representing over 500 million citizens. The Parliament has elected representatives from all the main political parties in Europe – conservatives, socialists, liberals, greens, variants of the extreme left and extreme right, as well as anti-EU parties, such as UKIP. I have visited both Parliaments of the EU, in Brussels and Strasbourg, and witnessed democracy at work by hard-working elected MEPs. It’s an insult to them, and to all of us who voted in the European elections, to suggest that the EU is not democratic. 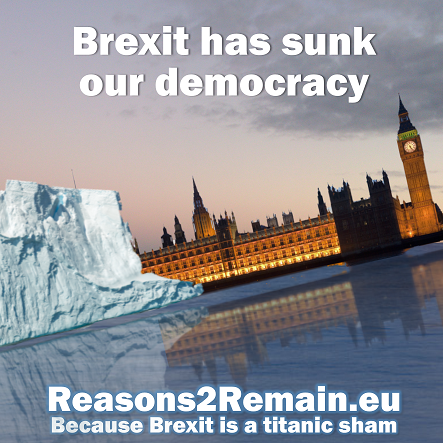 The EU is not quite the same as our democratic system in the UK, but the European Union is still a democracy none-the-less. It’s not perfect, but there is no perfect democracy in the world. In the UK, we don’t get to vote for who sits in the Cabinet or holds ministerial positions. We don’t directly elect our Prime Minister. We don’t elect our Civil Service. We have an unelected second chamber, and an unelected ‘head of state’. Over the past few decades, however, much more democratic power has devolved to the European Parliament, and I hope this ongoing process of democratisation will continue in the years and decades to come. Only one-third of the British electorate actually vote in the European Parliament elections. 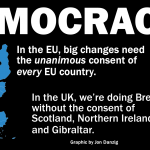 Maybe that’s why so many might wrongly believe Mr O’Flynn’s claim that the EU is not democratic. The Governor of the Bank of England, Mark Carney (himself a foreign worker) didn’t say anything of the sort. Let me be frank about this: Mr Carney did not say migrant workers bring down the salaries of existing British workers. In fact, Mr Carney has strongly praised ‘free movement of people’ as being good for Britain and Britons. Mr Carney actually asserted that foreign workers are helping to increase the UK’s productivity. On the BBC Radio 4 ‘Today’ programme, presenter John Humphrys asked Mr Carney if “cheap foreign labour” was actually stopping productivity increasing. He explained that most of the increase in labour supply has been down to British workers taking more hours, and older workers staying in employment. Over the last two years, increases in those factors have been 10 times as important as migration, Mr Carney asserted. Contrary to the implications made by Mr O’Flynn on Question Time, the Bank of England Governor has consistently supported Britain’s continued membership of the EU. In a lecture last October, Mr Carney said Britain’s membership of the EU since 1973 had improved the dynamism of the economy and increased the prosperity of all people in Britain. Mr Carney added that “the UK is the leading beneficiary” of the free movement of goods, services, capital and labour enshrined in European treaties. Furthermore, Mr O’Flynn’s description of ‘free movement of people’ across Europe as “untrammelled” is also misleading. There is not “untrammelled” free movement of people. Yes, as EU citizens we have a right to live, work, study or retire in any other EU/EEA countries. But under EU rules, we cannot just move to another EU country unless we have the means to look after ourselves. It’s a myth to suggest that it’s possible for EU migrants to come here, or for British migrants to go to another EU country, and immediately start claiming benefits. It’s only free movement if you can afford to move. This entry was posted in Agriculture & Fisheries, Current Affairs, Democracy & Citizenship, Economics & Trade, Energy & Climate Change, Environment, Global & International, Law & Justice, Media & Communications, Politics & Public Policy, The EU and tagged Bank of England, Bank of England Governor, BBC Question Time, dredging, EU Water Framework Directive, European Commission, European Parliament, European Union, Floods, Mark Carney, Patrick O'Flynn, UK Environment Agency, UKIP. Bookmark the permalink. The referendum will be decided upon by the abilitily or likely inability of the EU to halt the massive numbers of migrants flooding into Europe. As the unelected Commission has decided to resurrect the ridiculous quota mechanism, trampling over the elected Parliaments in Sovereign Nations, whilst doing so, its going to be a pretty hard sell. 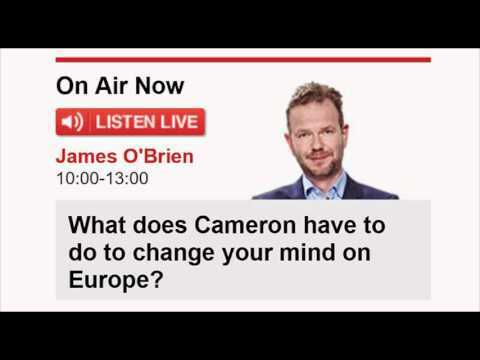 Perhaps rather than quibbling about the ins and outs of answers to questions on a weekly debating show you could put your journalistic talent to commentating on the mass sexual attacks on European women by young men claiming to need refuge. I am sure you could use photos of bruised, battered, crying young women to illustrate it, much as you used a dead kid on a beach previously. Yes, Roy, the UKIP guy on Question Time must be feeling pretty desperate if he has to use mistruths to present his arguments. The European Commission as a whole is of course elected by the European Parliament, which also has the democratic right to sack the entire Commission. I have already commented on the appalling crimes committed in Cologne. However, it appears that just a handful of asylum seekers may have been allegedly involved, and whilst that is completely unacceptable, the news reports need to be balanced by the fact that the vast majority of refugees are homeless, destitute, law-abiding citizens who need help. We have both a moral and legal duty to provide it, just as you and I would hope to be helped if we became stateless and refugees. That is a very unfortunate choice of words Jon. There were indeed many handfuls occurring, and not just in Clogne, in fact handfulling occurred all across Europe, disturbingly more often in the most accommodating Nations in terms of an open door immigration policy. In what is increasingly appearing a people against the establishment referendum, with immigration being at the top of people’s concerns when polled, policy that involves a never ending immigration ‘solved’ by unwelcome and unworkable redistribution policies imposed by an unelected body, are going to be rejected. The people of Europe do not just get their news from the established sources, they know very well the crime that has entered Europe via an insane wilkommen kulture, they know that Cologne was not a one off, and they know the establishment press covered it up and continues to do so. And no amount of bleating about what a politician says on Question Time will alter that. We don’t yet know the full facts of those attacks, it looked like a coordinated effort. Of course those crimes were appalling and unacceptable, but I feel we should wait to know more details of who actually committed them. For example, we don’t know what proportion of the alleged perpetrators were asylum seekers or illegal immigrants or others. I don’t condone, excuse or accept such behaviour, nor am I backtracking. I am not interested in helping or offering refuge to criminals or terrorists, from whom we need to be protected. I agree that this issue could sway the referendum result, but I sincerely hope not. I want Britain to stay in the European Union, but this is not a blind wish: there are clearly problems ahead, and I hope they can be resolved. Longer term, I feel Britain’s future prosperity and influence will be enhanced by us continuing to be part of the EU community, and helping to shape the future of the EU and its reform. 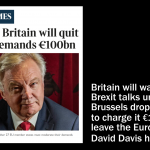 Let’s see; much can happen in the lead-up to the referendum result. As I have written many times, I will accept the democratic decision of the nation. In the meantime, I hope for a balanced, respectful and well-informed debate. I have encouraged all my readers to listen carefully to all sides of the argument to ‘REMAIN’ or ‘LEAVE’ the EU. Of course we know who perpetrated mass sexual abuse on European women Jon, we only have to listen to the accounts of brutalised young women in cities all over Europe to understand who did it. Dividing lines drawn between migrants, refugees and failed asylum seekers are entirely immaterial. This referendum will be decided on the issue of unrestrained, unmanaged and seemingly uncontrollable immigration to the EU by the poor and over populated of the world. Had they been of a culture that integrates and accepts a moral code found within Europe, it may have worked, as it is our new neighbours that have arrived without our mandate do not share our values. Recent history of 3 plus generations, throughout Europe, suggests the new wave will likewise fail to integrate, bring with them unwelcome cultural mores and violate our female relatives and friends. All this at a time when the EU has historically high unemployment, in particular within the young, austerity driven public spending cutbacks and the likelihood of mass redundancies through technical efficiencies. I am told to be scared of leaving the EU and its institutions, frankly, I am terrified of remaining. I doubt the victims of those awful crimes could know the true identities and origins of their alleged attackers. You may of course be right, but I will wait to know fuller facts in due course. I understand and respect that you don’t want Britain to remain a member of the EU. But we only have one vote each, so our votes I’m afraid cancel each other out. It will be up to others now to make the final decision. I reckon the result will be in the hands of those who currently ‘don’t know’. Let’s see. I am pretty.certain that hundreds of young women were capable of recognising whether those assailing them were of North African or Middle Eastern appearance, as they did, speaking German, as they didn’t or part of the new migration wave as they did, despite having fingers shoved up their orrifices, as happened. Perhaps you would like to disagree with their evidence and testimony. I am interested to know who the perpetrators of these alleged crimes were and how many were actually asylum seekers or refugees. I am not attempting to demean or lessen the terrible crimes, but I am interested in further information when it becomes available, especially as this might have been a coordinated attack. I think we will have to leave it at that, as the topic of the article and this discussion thread is about the comments made by a UKIP MEP on BBC Question Time. I know you want to steer the discussion in a different direction, but I have other blogs specifically about migrants and refugees, where comments are also welcome. I do want to try and keep discussions on topic. Of course you do Jon, those who think like you have studiously avoided this conversation since it was denied that mass sexual assaults happened, even now you pretend to not know who the perpetrators were, the bruised European women who were victims are obviously not reliable witnesses. Sadly for your ilk, you do not make conversation, and that conversation is being had, in pubs, bars, reastaurants and over dinner tables throughout Europe. So, I will leave this thread to the many people who were outraged that a politician was less than transparent in a televised public debate, after all that has never happened before. The mass sexual assault of European women celebrating NewYears Eve is after all commonplace, and hardly requires comment. I will return every day to note how many comment or or share your outrage. And I am sure you have, it’s just I cannot reference it when I search. Perhaps you could link to the article. Roy Jacobs, your comment is being deleted because it breaks my ‘rules of engagement’, which is not to make personally attacking comments. To be clear, I write hundreds of stories and it’s simply incorrect to try and place them in order of importance; some issues are much more important, others less so. I welcome divergent views and edifying and respectful debate, but ad hominem type comments such as the one you posted are pointless and take the debate nowhere. Delete away Jon, it bothers me little. Removing views you find uncomfortable is a short term solution. The issues remain, the opposing voices increase, your delete button is meaningless. Hmmm, not exactly full of comments, perhaps because most people understand that Politicians of all types tend to twist evidence when speaking on Question Time. Or perhaps they are considering the words of the French PM,, when he stated that the migration of millions into the EU will lead to its downfall. So Jon either the migration stops and borders are put in place, or you carry on with the migration and the European Project collapses. Roy Jacobs, Your second comment yesterday evening was also removed as it shows that you are intent on continuing personal attacks, casting aspersions against me, and making unfounded untrue comments about my journalism. This just brings down the tone of the discussion here and breaks my ‘Rules of Engagement’, which call for edifying, intelligent debate. Please don’t make comments personal. My article about the misleading Question Time statements by the UKIP MEP was published first on my professional Facebook page, where my article achieved (so far) a reach of over 60,000, 458 shares, 127 likes and 131 comments. I sometimes republish my articles here but this is not my main blog and probably doesn’t achieve much in the way of a large readership. Regarding the problem of refugees (who I don’t call migrants) it’s essential that the European Union provides a solution on how to handle the huge influx of refugees, otherwise the French Prime Minister is right, it could hurt the existence of the Union itself. The longer term plan needs to be to help bring peace and stability back to the the nations from where the refugees have fled, so that they can go back home and rebuild their countries. Most refugees want to go home, but sadly, they cannot. As I said Jon please delete my comments as you see fit, as only you and I are in discussion it appears somewhat childish, but I am an adult, so I can tolerate childish behaviour. I dont think I questioned your credentials as a journalist, perhaps you once were, although a BBC journalist is a fast diminishing profession, most are though at least payed to ply their trade, unlike you. Most journalists in the BBC are little more than loud speakers, trained to repeat whatever nonsense is required, those that do not follow the line are removed or silenced, the weakest of the crop, those that spouted the party line but were hopeless, write blogs. Thankfully we are long past the point where anything the BBC says is believed, like in the days of Pravda it has become a comical exercise. Your voice is unheard Jon, only I engage with you, your voice is small and insignificant, more shares and likes are given to skateboarding otters than whatever nonsense enters your head. I am unsure of your response, the French PM appears to believe either you can have an open door immigration policy from all those who you consider refugees, or the EU. I think you are suggesting the refugees being accepted are more important, even if that means the EU is finished. Roy Jacobs, you are attempting to make the discussion here about me, rather than about the subjects in hand. I welcome divergent views; I only disallow personal attacks, and if a poster came here and made personal attacks or aspersions against you, they would not be allowed either. Yes, the discussion here right now is limited to the two of us, but as I have already advised you, my posts get hundreds of thousands of reach on my main Facebook page*, with many hundreds of comments. Did you choose to ignore that comment? I have never believed in, nor endorsed, an entirely open-door immigration policy. I have proposed that Britain should do its fair share in helping the refugee crisis, but the longer-term solution is to help to bring peace and stability back to the countries from where the refugees have fled, so that they may return home and rebuild their countries. I think you need a thicker skin Jon, the one you are wearing is terribly thin. In all probability on Monday the Schengen Area, another of the EU’s precious principals will be shut down, I understand a period of two years is being discussed, in all probability that means for much longer. Politicians across Europe are being forced to make a decision, either they hang onto the European Project and get rejected by their citizens in National elections, or they ditch the project and possibly get rewarded by re election. For the majority its a no brainer. The whole EU, its institutions, its currency, its flag and anthem, its parliament, all now hang in the balance, another Paris, another Cologne, another cover up and all bets are off. It is somehow fitting, that the very survival of the EU now sits in the hands of the million plus immigrants that those like you cheered into Europe, if I were in your shoes i would be worried. Officially we now have 1.1 million immigrants in Europe, every day thousands more arrive, in the spring the numbers are likely to dramatically increase. As you are not an advocate of open borders, I presume you have a maximum number that can be absorbed into European Nations, what exactly is that? Roy Jacobs, it’s a principle that I am against ad hominem/personal comments as it’s not a good style of debating, and nothing to do with whether I have a thick skin or not. If you don’t agree (as you seem intent to continue with personal comments) then please stop posting here. If you are genuinely interested in my point of view, you can find my considered opinion on many of the issues you have raised in the many articles I have already published. I think it’s wrong to lump all types of migrants in the same category – EU migrants, non-EU migrants, asylum seekers, refugees and illegal immigrants are all different, and the response and migration policy needs to reflect that. Regarding EU migrants here, I believe that the numbers coming are already adequately controlled by the jobs market. Almost all EU migrants in Britain are gainfully employed, and making a massive net contribution to our Treasury and our economy. I would not make it more difficult for them to come here and seek work, as Britain needs them – we have more vacancies than can be filled by the indigenous workforce. If EU migrants were just coming for benefits, I would be strongly against such EU migration, but EU rules, that we democratically agreed, state that EU citizens cannot just move to another EU country unless they have the means to look after themselves. There isn’t a problem of so-called ‘benefit tourism’. About the same number of Britons live across the rest of the EU as the number of EU migrants living in Britain, so the numbers are balanced. I am for ‘free movement of people’ – making it difficult to move here from, say, Lyons would be as daft as making it difficult to move from Liverpool to London. Regarding non-EU migrants, these are already strictly controlled by an Australian style points system. It’s up to our British government to effectively control non-EU migration here. Regarding refugees, Britain should be helping to alleviate the world-wide refugee crisis by offering refuge to a larger number. We could easily accommodate more and we should, in my view. I have written about this in my response to Peter Hitchen’s article in the Daily Mail when he opined that this country should not take in refugees.